It was the afternoon of October 12th, the evening before the 100th Anniversary of the Miracle of the sun. 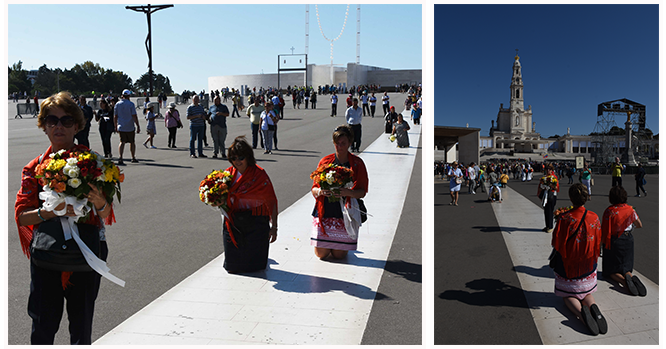 Expectation hung in the air as the plaza at the Fatima shrine filled with pilgrims from around the world. 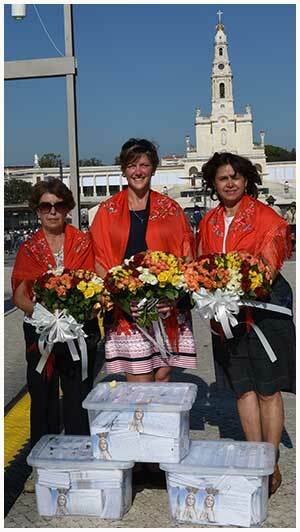 Our job: to arrange nearly 30,000 red and white roses on the esplanade as an offering to the Mother of God. Knowing that each red rose represented the dedication and love of a Rosary Rally Captain, and each white rose represented the devotion and love of Rosary Rally Sponsors, we took special care in order to make a magnificent presentation. 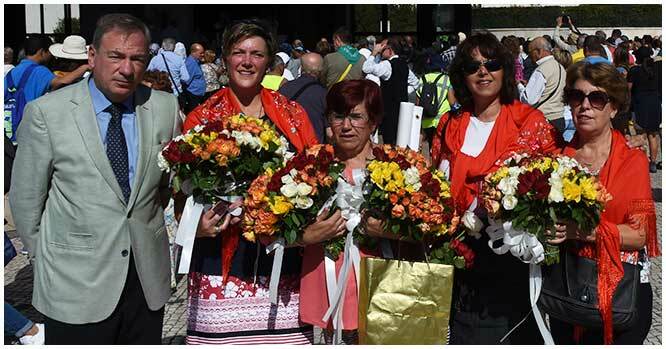 The presence of such a vast number of flowers could not help but draw the attention of many pilgrims who stopped to ask where the roses came from. 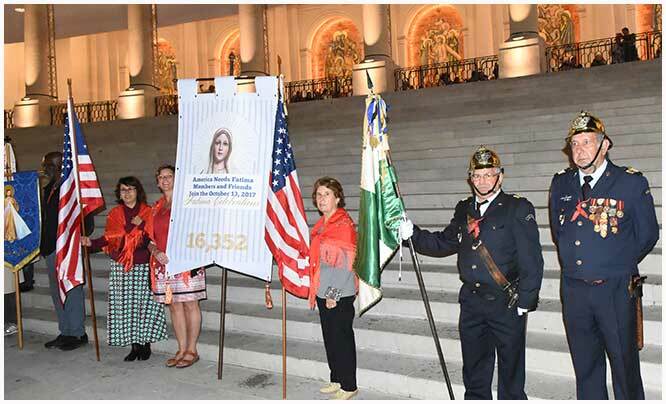 With great pleasure we explained the America Needs Fatima Rosary Rally Captain program and the number of Rallies being held in America on the 14th in honor of the Mother of God. Even with the inevitable language barrier that exists in a multi-national crowd, the smiles that followed our explanation showed they were pleased to know that devotion to Our Lady of Fatima is alive and well in the U.S.A.
About an hour later our first mission was accomplished and it was time to tackle our next objective: the delivery of three large plastic bins of hand-written prayer intentions to the feet of she who loves to answer the prayers of her children. In the long trek from the car to the Basilica, we were thankful for the prudent purchase of a small hand dolly which made carrying such precious cargo a little easier! The time for the candlelight vigil ceremony was fast approaching, as evidenced by the number of pilgrims who continued to flood the plaza as the sun began to sink in the sky. We hastily made our way back to the car to retrieve the America Needs Fatima name banner. 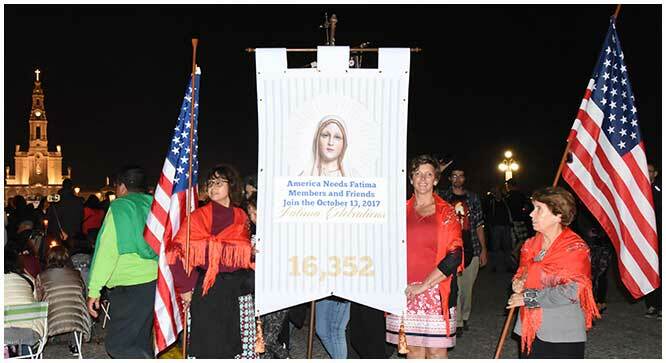 Knowing that many of our friends and supporters would have liked to come to Fatima with us, we offered to have their names carried during the candlelight ceremony. No less than 16,352 devout Catholics took us up on the offer and their names were carried high above the candles that flickered like so many stars across the shrine. My friends and I prayed very specially for all those whose name we carried during the candlelight procession. It is truly a touching moment; to see so many thousands of candles, so much devotion to the Mother of God all in one place. After many hours, the ceremonies came to a close and it was well past midnight when we made our way wearily back to our lodging for the night. Click here to see videos from Fatima! The morning of October 13th dawned with a slight haze across the sky. Where was the sun? Never fear! It made a glorious appearance just as Holy Mass began! Once again we entered a plaza simply packed to the brim with devotees of Mother Mary. Of course, we were too far from the altar to see what was happening, but large screens were provided to the left and right of the altar so that even those at the back of the crowd could participate in the Mass. When the time arrived for receiving Holy Communion, hundreds of priests penetrated the crowd to bring the healing Body of Christ to all. The sun shone brightly at its zenith. It was 12:00 noon and we were there to witness a new miracle—the Miracle of the Son, as with quiet reverence members of the Body of Christ, which numbered in the hundreds of thousands, received their Eucharistic Lord. Our strength renewed, we set about our final act of devotion on behalf of all our America Needs Fatima friends and supporters. Carrying two three-foot-tall red candles, we made our way to the votive sanctuary. These two candles represented the prayers of thousands of our dear friends who had returned their small candles to America Needs Fatima to be used to make the large candles we now carried. Evidently very large and very special, our candles once again attracted the attention of the other pilgrims. Many asked where they could purchase such beautiful candles! Saying a special prayer of thanksgiving for all those who made our pilgrimage possible, we lit the large red candles and placed them carefully among the others, their flames flickering in silent testimony to the love that burns in the hearts of so many Americans for Our Lady of Fatima. One hundred years have passed since the Mother of God came to deliver to mankind her plan for peace: prayer, penance and conversion. Sadly, mankind continues tragically slow to respond to her call. With renewed confidence in her love for us, let us all multiply our efforts to make Our Mother and her Fatima message known and loved across America and around the world. It is up to each one of us, through our correspondence to grace and the Fatima message, to speed up the triumph of Mary’s Immaculate Heart over mankind as she predicted at Fatima.